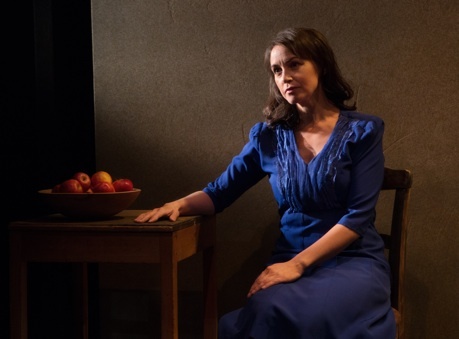 Kate Cayley’s latest play, The Bakelite Masterpiece, now receiving its world premiere at the Tarragon Theatre, is one of those plays that has been surfacing recently at that theatre that is so obviously flawed it is a wonder it made it to workshops, let alone to a full staging. The story of Han van Meegeren (1889-1947), one of the great forgers of the 20th century, is fascinating, but Cayley manages to make his story so full of pretentious earnestness that the play becomes boring despite a running time of only 70 minutes. In this two-person show, Cayley has both characters serve as narrators. She has Van Meegeren (Geordie Johnson) set up the story using the background of the real forger’s life. Van Meegeren started out as a painter in his own right but his works were criticized as derivative. Van Meegeren decided to make this flaw into a virtue by becoming a forger with the goal of fooling the greatest art critics of his period besides accumulating a fortune. He focussed on forging works of the great masters of the Dutch Golden Age like Frans Hals (1582-1666) and Johannes Vermeer (1632-75). He invented a scheme not merely to paint in the style of earlier artists but to make the painting look as if they were 200 years old. To do this he would use canvas from the 17th century and mix paints with the ingredients in the same way painters of the time would have done. His great invention was to add the early plastic phenol formaldehyde (commercially known as Bakelite) to his paints so that when baked they would achieve the hardness that oils do over hundreds of years. He also learned to simulate the cracking and darkening that painting of Old Masters acquire over time. In Cayley’s play as in history, Van Meegeren is arrested in 1945 after the end of World War II for having sold a painting by Vermeer, thus a Dutch cultural property, to senior Nazi Wehrmacht commander Hermann Göring. To commit such an act was treasonous and carried the death penalty. The subject of the painting was Christ with the woman taken in adultery, which Van Meegeren presented as a newly discovered work from Vermeer’s early (and purely conjectural) Biblical period, before he began painting the everyday contemporary subjects that later made him famous. In Cayley’s version Geert (Irene Poole), a female Dutch military captain with an art degree is assigned to investigate the case. She is efficient and taciturn and merely wants Van Meegeren to sign a confession she has drafted so that he can be executed. Van Meegeren’s defence, indeed the same one that he later used in his real trial in 1947, is that he is a forger and sold Göring a Van Meegeren, not a Vermeer, and thus is not guilty of selling a “Dutch cultural property”. In history Van Meegeren was detained in prison while his claim was verified. Earlier, in 1945 over the course of four months he painted Jesus among the Doctors in the style of Vermeer in the presence of reporters and court-appointed witnesses. Cayley takes this historical incident but makes it ridiculous. Geert has been so unsympathetic to Van Meegeren that she will allow him only two minutes to explain himself. Yet, only a few minutes later Cayley has Geert not only agree to let Van Meegeren paint another Vermeer to prove how good a forger he is, but acquires his full list of needs, including a 17th-century canvas, period ingredients including the extremely expensive lapis lazuli and, even more incredibly, gin and morphine to which he has become addicted. Pushing an already unbelievable plot development into complete implausibility, Cayley has Geert suggest that Van Meegeren’s subject should be herself. How does a person who previously was so concerned with proper procedure and objectivity, suddenly allow such an extensive breech both of procedure and waste of her supposedly valuable time? What is Geert’s motivation, reserved as she is, in having her portrait painted at all? Cayley gives us no explanation for this bizarre turnaround. A Biblical subject such as the real Van Meegeren actually painted and that would not require her presence might make sense. Cayley’s choice leads to the laughable situation of Geert supposedly posing as a typical Vermeer subject and yet, in her capacity as an officer, commanding Van Meegeren to keep painting. How, possibly, can the subject simultaneously maintain the required reflective spirit alongside an actively aggressive stance? Thus, neither the situation nor the character make sense. Cayley is not primarily interested in character, more the pity since Van Meegeren would be such an interesting case. Like After Akhmatova, her previous play for the Tarragon, Cayley is also uninterested in generating dramatic tension. Rather, Cayley uses the situation in Bakelite to explore various implications of forgery. Thus, if a forged paining makes brings forth real emotions in a person, how important is it’s falseness? She pursues this into the Dutch government’s need to have people to condemn as collaborators. She even wants to give the notion theological implications by having Van Meegeren suggest that Lucifer rebelled against God out of curiosity, just to see if he could get away with it. Any Dutch person would know the story of Lucifer since it is the subject and title of the greatest play (1654) by the greatest playwright of the Netherlands, Joost Van den Vondel (1587-1679). Cayley’s forger trivializes the topic since Lucifer’s sin is not curiosity but pride, and if she wanted to, Cayley could easily have made that Van Meegeren’s flaw as well. In terms of exploring the topic of forgery, Cayley brings forth nothing beyond what the many novels and plays about forgery have already covered such as William Gaddis’s The Recognitions (1955) or Robertson Davies’ What’s Bred in the Bone (1985). As far as people living on forged beliefs, that idea is no newer than Ibsen’s notion of the “life lie”. What makes the play watchable are the fine performances of Geordie Johnson and Irene Poole. It is great to see Johnson on stage again. He caresses every word as if milking out all the irony it contains. If the text were by Shakespeare this would be wonderful, but it is not. Yet, his portrait of a self-dramatizing artist is fascinating in its own right. He also carefully distinguishes Van Meegeren when in full possession of his faculties versus his decline after too much gin and morphine. Cayley has written a thankless role in Geert. Poole draws as much as she can out of it, but since the author has ignored the character’s motivations, there is little Poole can do to bring out what isn’t there. Cayley does give Geert one good moment, when the captain reacts to the finished painting. This Poole does superbly, making one wish Cayley had given Poole more scenes to demonstrate her talent as an actor. Designer Charlotte Dean and lighting designer André du Toit have combined to create the impression of a Vermeer painting of umber hues that make Geert’s ultramarine dress stand out. Du Toit takes great pains to recreate the kind of soft, revelatory light that Vermeer was so famous for. Cayley has Geert supply a postscript to the play that directs us to the mystery of what Christ was writing in the earth in John 8:6-8. If Cayley were really interested in forgery as a topic and in Van Meegeren in particular, she misses out a great chance to point of one of the supreme ironies of his career. Van Meegeren’s forgeries became so famous that exhibitions have been organized of them several times since his death. Not only that, despite being forgeries, their fame has caused them to rise in value so that some artists have taken to painting and selling fake Van Meegerens. The story of this Dutch forger is one that is truly stranger than fiction yet more comprehensible than the feeble fiction Cayley has chosen to devise. Photos: (from top) Geordie Johnson and Irene Poole; Irene Poole. ©2014 Cylla von Tiedemann.